Let’s call it the Sandwich Artist Principle, the way so few American framebuilders purport to be doing labor. While a few exceptions exist, most builders instead stay on-message -- they’re producing art, not goods. 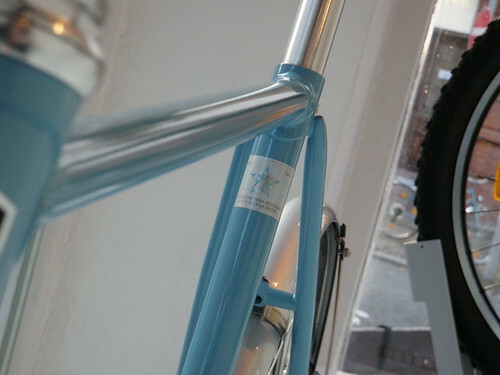 The emphasis on the various mini-sculptures on a ‘handmade’ bike -- the lugs, the dropouts, the headtube badge, the myriad other expressive details -- I worry that it’s a smoke screen. Is there over-attention to the aesthetic at the expense of the practical, i.e. How does the bike ride? Does the seatpost slip? Does the rear wheel center in the stays? Why this geometry? Further, when the near-singular focus is on ‘beauty’, what becomes the basis for establishing fair market value? In other words, in the little lovely details is there license for unjustifiably inflated prices? Muse. Brancusi postcards tacked to the wall. Inspiration. Radiohead turned up to 11. I worry that our industry is being polluted by inked-up indie rock kids who spent a week at the UBI (the framebuilding equivalent of the poetry workshop at your local library). With zero basis in anything measurable (be it something heartfelt, something visible, or something feel-able on a ride), they charge 80% of a Serotta/Sachs. Where are their stories of apprenticeship? Where is the evidence that they’ve had consistent reps on the jig with good results? Where is the admission that theirs is a craft that will improve over time therefore now, in the teeth-cutting stages, hey I’ll sell you a frame for $800 since I’m new here and covering my cost of materials is a win-win? What I want from my airline pilot, what I want from my sushi chef, I also want it from my bike maker: The tyranny of mentorship. That starved march, measured in inches, to experience. In any business are the rookies ever humble? What a divide to behold -- the one that separates rookies from apprentices. I dig the latter. Far too many here in America are the former. Facebook generation framebuilders: Really, who are these people? 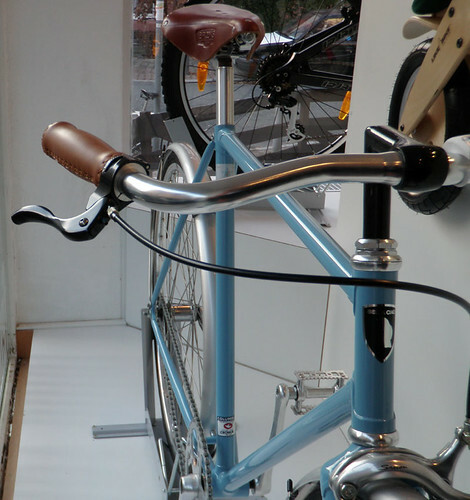 Why are people buying their bikes, or, rather, are people buying their bikes? There’s something heartening to me in the Seven Cycles M.O. -- where extraordinary raw materials & regimented process is king, and the welder’s cult of personality gets checked at the door. 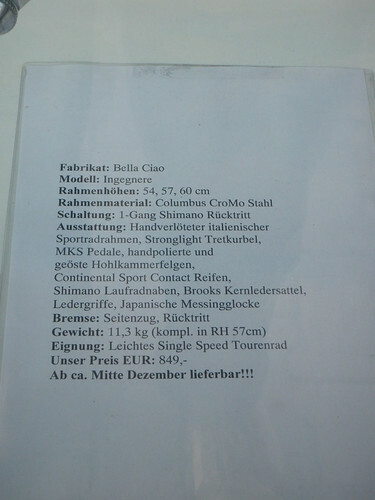 Or, at a lower price-point, the humble-but-tangible beauty of the Bella Ciao I saw in Germany -- the Columbus tubeset, the austere lugs and faintly sparkly paint. 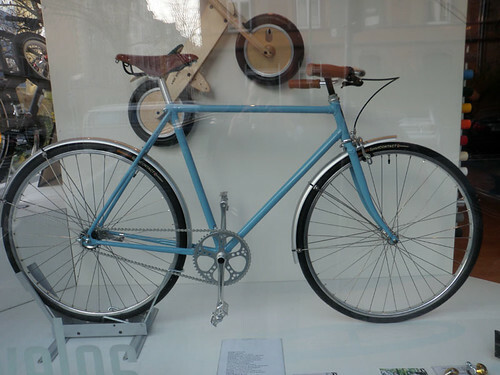 I’ll take its predictably reliable Taiwanese manufacturing, no less handmade than all the Sandwich Artists of Portland, and it’s a complete bike at €849 no less (for those of you w/o calculators that’s <$1,300). They won't even let you into the NAHBS hall if your frameset sticker price is less than $2k. 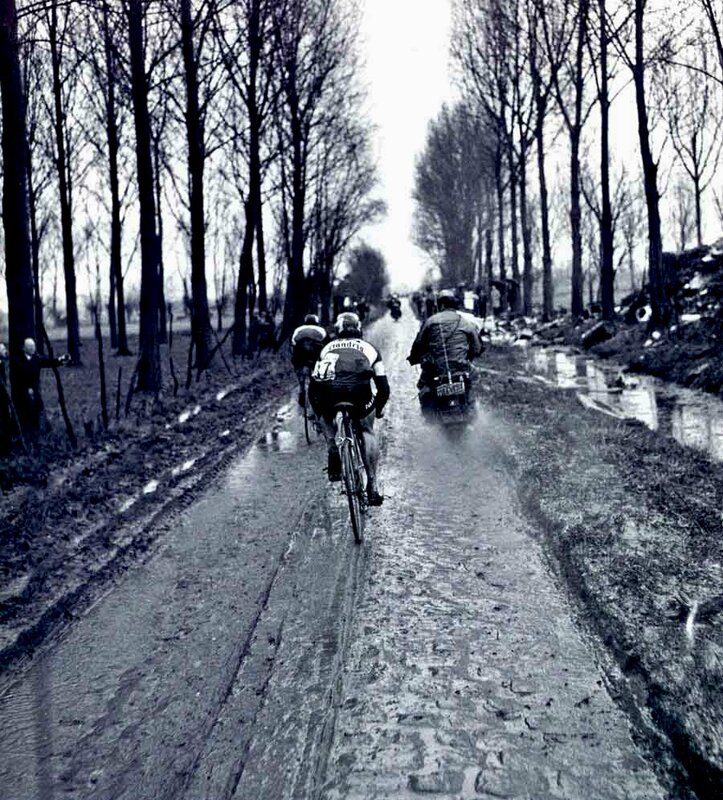 – Whether you’ve ever attended a spring classic or not, it’s easy to appreciate photos of rain-slicked cobbles. But if you’ve stood there on the roadside (if you’re lucky, it’s in Belgium in sideways hail) then this is a ringtone you’ll be sorely tempted to put on your phone. – Our good PRO pal Craig Lewis gave his blog a facelift pretty recently. And now he’s calling for entries to re-name it with some good swag on the line for the winner. – Bike biz marketing man Josh Kadis rightly bemoans the lack of flavor to most of the ‘Cycling photo of the year’ contests going on. So, in an act that was not intended to be ironic, he compiles his own list of ‘Photo of the year’ candidates, most of which are rather bland themselves. – Stupendous vintage footage of Contador. He got close enough to that lamppost to kiss it. – Giro sunglasses rank #1 as the most technically underrated thing we sell. This docutorial is probably 2x or 3x longer than it needs to be. But it’s worth a quick look nonetheless. – I can’t exactly figure out what this company does. 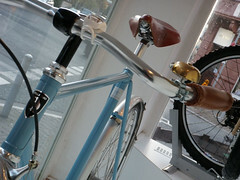 But I have a feeling they might bring us the next big step forward in the current GPS-on-the-bike craze. – I’m developing a shoe fetish, and I’m not talking about Sidi or Shimano. Can someone please define ‘bicycle toe’? The phrase, as might be expected, caught my eye. – The one commonly-cited redeeming quality of Interbike is the Dirt Demo expo. Some compelling competition is slated for 2010. It’s hard not to root for Dealercamp, since it’s natural to root against all things Las Vegas. – Most recent data shows that the US bike market is cratering. More detail can be found here. Road bikes are doing nicely despite it all (how PRO! ), but given the overall trends it paints a dim, dim picture of the mountain bike industry.